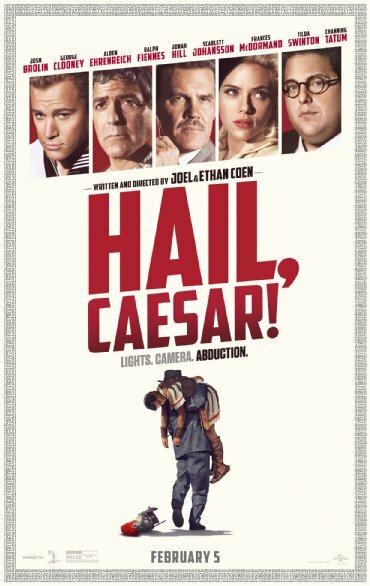 The most anticipated film of 2016’s first quarter is quite possibly Hail, Caesar!, the latest film from Joel and Ethan Coen. For most, it didn’t really matter what the film’s subject matter even was. The idea of the Coen Brothers having a new film out in theaters is an exciting prospect for people like me to go buy tickets for the opening weekend. However, the subject material (as well as the cast that they’ve assembled for this film) will probably help the film’s box office prospects pretty well. Even though general audiences don’t really care for films about making films, I feel that they’ll warm to the prospect of one directed by the Oscar-winning duo. Here’s my review of Hail, Caesar! Josh Brolin stars as Eddie Mannix, a real-life figure in the golden age of Hollywood who is a fixer and the head of production at Capitol Pictures, a fictional film company that is about to make a film called Hail, Caesar!, which stars movie star Baird Whitlock (George Clooney) as Caesar. Whitlock is kidnapped by a mysterious group of individuals, which has the entire studio go into disarray because of this. Mannix gets the help of directors, actors, and so on to help locate their biggest movie star before the press finds out about his kidnapping. As mentioned before, the cast for this film is enormous. Along with Brolin and Clooney, the film features Channing Tatum as a Gene Kelly-type actor (with one of the best dance numbers I’ve seen on screen in quite some time), Scarlett Johansson as a actress for the studio with a child problem, Tilda Swinton as twin sisters who are both gossip columnists, Ralph Fiennes as an English director whose having a rough time directing Alden Ehrenreich’s character, a cowboy who was turned into a movie star overnight. There are a bunch of established actors (some are Coen’s regulars) that pop up in fun little one-off scenes that I won’t reveal for you. And I guess you could say that my consensus on the new Coen Brothers film was that I really, really liked it. I was shy of loving it, but I really enjoyed the time that I spent in the theater watching the film. Josh Brolin is phenomenal as always in the role of Mannix, which behind his terrific performance in No Country for Old Men is arguably his best role yet with the Coen’s. George Clooney is a lot of fun to watch as this Kirk Douglas-esque character, since most of the time he’s on screen he’s incredibly delusional. Channing Tatum, even though he’s only in the film for a handful of scenes, is great as singing-sailor for a film he’s starring in. As big as the cast is, the focus of the film is primarily on Mannix’s story, Whitlock’s kidnapping, and Ehrenreich as this young up-and-comer, who becomes involved in this mystery in ways that I won’t reveal. Hail, Caesar! is the Coen’s first straight-up comedy since 2008’s Burn After Reading (A Serious Man was incredibly funny, but I wouldn’t consider the film a “comedy”). I wasn’t disappointed by Hail, Caesar!, but for some reason I felt that there was something missing the whole time. Maybe I’ve just been spoiled by the last 4-5 movies the Coen’s have made since No Country for Old Men, and how they’ve all stood out from the past couple of movies released in that time span. I didn’t feel the emotional gut-punch that I felt when I saw Inside Llewyn Davis a few years back, or True Grit. Granted, this argument is incredibly stupid since this film is more of a mainstream comedy poking fun at the studio system in the 1950s, and the Red Scare that swept the industry during that said time. It’s a very funny movie and a very well made one, but just make sure you know that’s the film you’re going to see. But, all in all I had a lot of fun with Hail, Caesar!. The Coen Brothers are probably the best filmmakers nowadays that can perfectly incapsulate a certain period in time for every one of their films, and this film is no different. If you love the Coen’s like I do, you don’t need me to tell you to go see this film. You’re going to see it, and you’re going to have a good time with it. While the film is under two hours and feels incredibly breezing thanks to that, it almost leaves you wanting more. I loved this era of Hollywood that the Coen’s have just showed me on film for the past 100+ minutes, and I didn’t want to leave it just yet. I guess if you’re feeling the same feeling after this film, you could probably just re-watch Barton Fink again, and you’ll be alright.